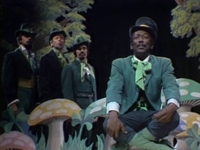 One of the reasons that I love Saint Patrick’s Day is because it gives me an excuse to listen to one of my all-time favorite songs, “Danny Boy“. If there were ever any doubt about my ancestry (I’ve got some “Kelly” and “Carroll” in my family tree), the way that this tune makes me feel like I’ve “come home” puts that to rest – there is no denying that music from the British Isles is the kind of music that stirs my soul. In putting this post together, I listened to a LOT of different versions of the song, and I ran across one that surprised me. You see, I’ve only ever known Bob McGrath as a performer on “Sesame Street” – I didn’t have a CLUE that he had such an amazing voice! This entry was posted in Annual Posts, Holiday/Patriotic, Holidays, Music and tagged Bob McGrath, Danny Boy, Garrett Morris, Saint Patrick's Day. Bookmark the permalink.